Home / Technical Articles / Do you know what ground potential rise is? It’s really important. First of all, ground potential rise is very important and very dangerous event. The grounding engineer will be required to develop safety systems to protect any personnel working where ground potential rise hazards are known to exist. Federal law mandates that all known hazards must be eliminated from the work place for the safety of workers. It is the engineer’s choice on which voluntary standards to apply in order to comply with the law. There are many different worldwide laws that specifically states that step and touch potentials must be eliminated on transmission and distribution lines that include any related communication equipment. Substations are always considered workplaces and step and touch potentials must be eliminated. Transmission and distribution towers or poles are not always considered work places and therefore are often exempt from these requirements. Take, for example, a lonely tower on a mountain side or in the middle of the desert — these towers are not typically considered workplaces. However, any high voltage tower or pole becomes a workplace as soon as equipment is installed that is not related to the electric utility company and requires outside vendors to support the new equipment. 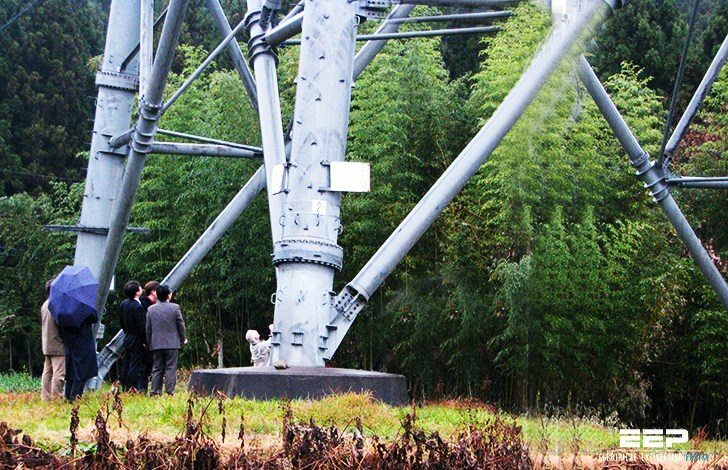 Cellular telecommunications, environmental monitoring, and microwave relay equipment are good examples of equipment that, when installed on a high voltage tower, turns the tower into a workplace. This would make the elimination of step and touch potentials required. Fibrillation current is the amount of electricity needed to cause cardiac arrest, from which recovery will not spontaneously occur, in a person and is a value based on statistics. IEEE Std. 80-2000 provides a method to determine the pertinent value of fibrillation current for a safety study, along with a good explanation of how it is derived. Many different methods exist for calculating fibrillation current; however the 50kg-IEEE method is the most commonly used in North America. The formula used shows that the fibrillation current level is inversely proportional to the square root of the fault duration. However, it must be increased by a correction factor, based on the subtransient X/R ratio, which can be quite large for shorter fault durations. If personnel working at a site during fault conditions experience voltages that will cause a current less than the fibrillation current to flow in their bodies, then they are considered safe. If a worker will experience a greater voltage than is acceptable, additional safety precautions must be taken. The subtransient X/R ratio at the site of the fault is important in calculating the acceptable fibrillation current and to determine the maximum allowable step and touch voltages that can occur at any given site. Fault duration is a very necessary piece of data for properly calculating step and touch potentials. The fault duration is the amount of time required for the power company to shut off the current in the event of a fault. Each site will have different levels of voltages for both of the above. Unfortunately, we cannot simply say that a human being can withstand X-level of voltages and use that value all the time, since this voltage is determined by the surface layer resistivity, the fault duration and the subtransient X/R ratio. Additionally as each site has different fault durations and different soil conditions, it is critical that calculations be made for each and every possible fault location. 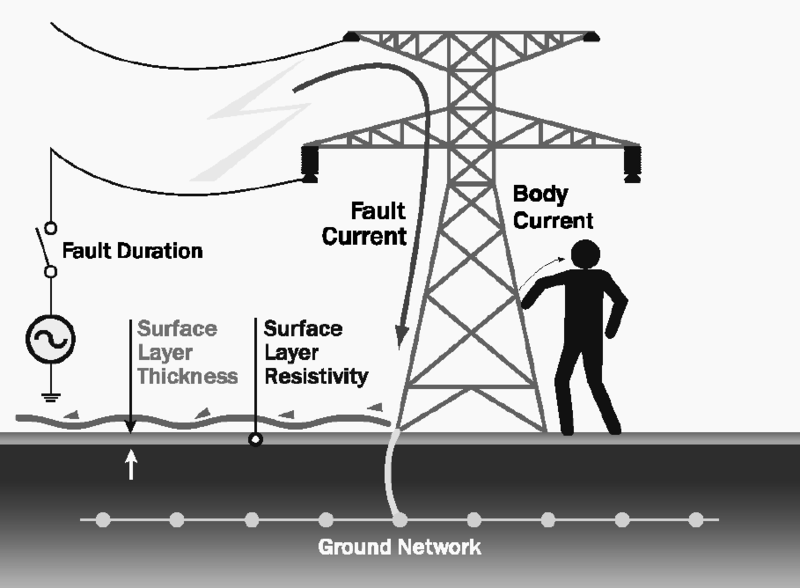 When a fault occurs at a tower or substation, remember that the current will enter the earth. Based on the distribution of varying resistivity in the soil (typically, a horizontally layered soil is assumed) a corresponding voltage distribution will occur. 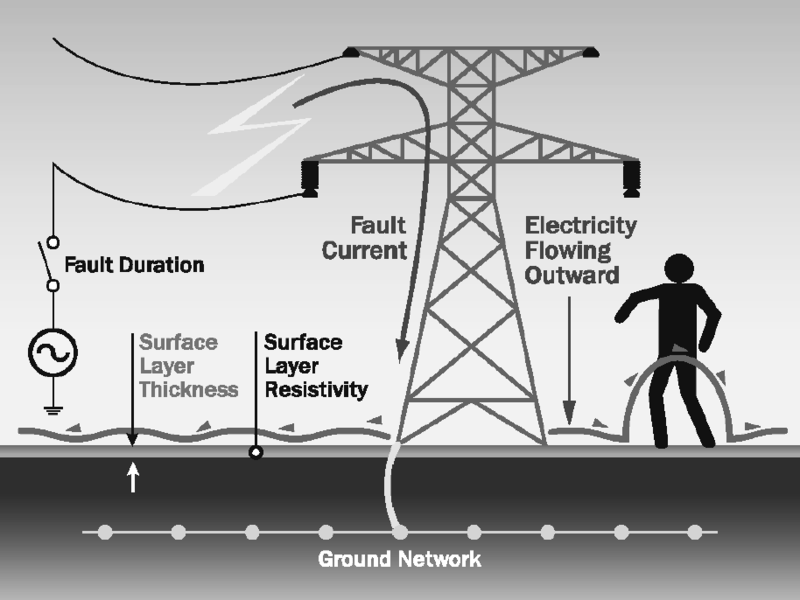 The voltage drop in the soil surrounding the grounding system can present hazards for personnel standing in the vicinity of the grounding system. Personnel “stepping” in the direction of the voltage gradient could be subjected to hazardous voltages. In the case of step potentials, electricity will flow if a difference in potential exists between the two legs of a person (Figure 1). Calculations must be performed that determine how great the tolerable step potentials are and then compare those results to the step voltages expected to occur at the site. Hazardous step potentials can occur a significant distance away from any given site. The more current that is pumped into the ground, the greater the hazard. Soil resistivity and layering plays a major role in how hazardous a fault occurring on a specific site may be. High soil resistivities tend to increase step potentials. A high resistivity top layer and low resistivity bottom layer tends to result in the highest step voltages close to the ground electrode. The low resistivity bottom layer draws more current out of the electrode through the high resistivity layer, resulting in large voltage drops near the electrode. Further from the ground electrode, the worst case scenario occurs when the soil has conductive top layers and resistive bottom layers. In this case, the fault current remains in the conductive top layer for much greater distances away from the electrode. An important note to remember is that most power companies use automated reclosers. In the event of a fault, the power is shut off and then automatically turned back on. This is done in case the faults occurred due to an unfortunate bird that made a poor choice in where to rest, or dust that may have been burned off during the original fault. A few engineers believe that fibrillation current for step potentials must be far greater than touch potentials, as current will not pass through any vital organs in the former case. This is not always true as personnel that receive a shock due to step potentials may fall to the ground, only to be hit again, before they can get up, when the automatic reclosers activate. When a fault occurs at a tower or substation the current will pass through any metallic object and enter the earth. Those personnel “touching” an object in the vicinity of the ground potential rise will be subjected to these voltages which may be hazardous. For example if a person happens to be touching a high voltage tower leg when a fault occurs, the current would travel down the tower leg into the persons hand and through vital organs of the body (Figure 2). It would then continue on its path and exit out through the feet and into the earth. Careful analysis is required to determine the acceptable fibrillation currents that can be withstood by the body if a fault were to occur. Engineering standards use a 1-m (3.28 ft) reach distance for calculating touch potentials. A 2-m (6.54 ft) reach distance is used when two or more objects are inside the ground potential rise event area. For example, a person could be outstretching both arms and touching two objects at once such as a tower leg and a metal cabinet. Occasionally, engineers will use a 3-m distance to be particularly cautious, as they assume someone may be using a power tool with a power cord 3 m in length. The selection of where to place the reference points used in the touch potential calculations are critical in getting an accurate understanding of the level of hazard at a given site. The actual calculation of touch potentials uses a specified object (such as a tower leg) as the first reference point. This means that the further away from the tower the other reference point is located, the greater the difference in potential. If you can imagine a person with incredibly long arms touching the tower leg and yet standing many dozens of feet away, you would have a huge difference in potential between the feet and the tower. Obviously, this example is not possible – this is why setting where and how far away the reference points used in the touch calculation is so important and why the 1-m rule has been established. If you come across a downed power line, stay as far away from it as you can. Assume it is live. Never touch a downed power line or anything near it. u have explained touch and step voltage which can be calculated, and the results can be compared with the tolerable levels. However I want to know that is there any standard value for GPR, that it should not exceed. I didn’t find any reason why we are finding GPR in every earthing calculation which is of no use in earthing design. Only thing in IEEE 80 which I see that if the GPR is less than the tolerable touch voltage then no need to calculate the mesh voltage. Considering the high fault current nowadays that is not going to happen. You know what is the problem. In relation to earthing, we have moved away from deterministic designs to probabilistic earthing designs to ensure the necessary effort is focussed where it is needed, e.g. asset in metro area vs asset in country. We are require to demonstrate due diligence and not just designing to predefined “static” values. Would like to hear your view on that. Thank you for all the articles you share with us. Your website is very good! I like it very much! And If I would ask for something, I would like to read about electrical and mechanical articles of tunnel engineering.